Owen at the hospital on May 4th. 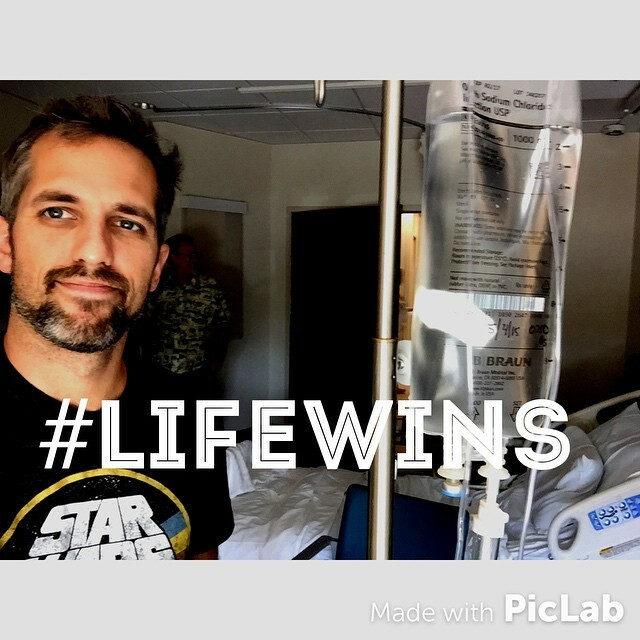 As most of my readers know, on May 4th my husband was diagnosed with cancer. We learned after some tests that he has stage 2 Malignant Thymoma. He has been in a lot of pain. He has lost a lot of weight. And so we eagerly await the surgery needed to remove the 10 cm sized tumor in his chest. On the other hand, we do not look forward to the likely chemotherapy that he may have to take prior to the surgery or after. 1. That God loves us, and will be with us through this fire. We know that cancer is a byproduct of living in a fallen world. God promises to redeem this world and one day, after all who will come to him come to him, he will recreate the Earth, and there will be no more death, crying, sadness, or pain because all the old ways will be gone. But until that glorious day, we get illnesses. But God promises to those who love him and are called according to his purpose, that he will be with them by either keeping them from the fire, or being with them through the fire. I don’t know why Owen has been allowed to have a type of cancer with a good prognosis while others do not. I do not know why Owen has been allowed to have cancer when others do not. But I don’t doubt God’s love for us or any other cancer victim for that matter. God love us all so much he sent his son to die on a cross, so that one day, we can rise again and live forever in his presence no matter how we have rebelled against him in our lives. We can put up with Cancer knowing what awaits us in eternity. But even here in this age, I know he can use Cancer to do good. And that he plans to do that with us. He is allowing it, to do good in our lives. 2. We have an amazing network of people in our lives. Honestly, it has been quite humbling. You all make me want to be a better person. You have reached out to us and blessed us more than we have ever helped and blessed others. I’ll pray. I’ll make an occasional meal. I’ll make a small donation here and there. But that’s about it. I mean we have people who are not even friends reach out to us. One person, for example, whom we have nothing in common with and with whom we have even heatedly debated our differences reach out and not just give, but give generously. God has shown his love for us through all of your amazing and wonderful support. The calls, the texts, the food, the house cleaning, the donations, the prayers, the hugs…we feel it. Thank you, to everyone who has reached out to us. 3. My husband continues to impress me and I am falling even more in love with him. The way he has endured his pain. The way he continues to work. They positive attitude he maintains. How honest he is with me about what he is going through spiritually, emotionally, and mentally. The amount of compassion he has developed for others with cancer or who have other health conditions that need medicine. I’m in awe of this man. And I’m honored to be his wife. 4. To show more grace toward my husband. In the end–no matter what he has done or hasn’t done to irritate me, he is My Love. And I would be devastated if I lost him. When faced with the reality that without medicine, my husband would die from this cancer inside him, nothing he does or doesn’t do is worth fighting over, or pouting over, or holding bitterness against him. I love him. I’ll take him. Flaws and all. I hope he feels the same way about me. 5. There are things you shouldn’t tell people who have just told you they have been diagnosed with Cancer. 6. I’m stronger than I thought I was. I can only guess this strength comes from God because I don’t know this new, strong version of myself. I’m a crier. I used to cry at least once every day about something. But God and my husband have been working on me the last 6 years, teaching me to have self-control, teaching me to trust God and not be so easily overwhelmed or offended. I think its been all in preparation for this. We are going to get through this. I can be strong for my husband. He needs me to be strong. So what about you? For those of you who have struggled with cancer or who have watched a loved one through the illness, what did you learn? I know we are just at the beginning, especially if Owen does get chemotherapy. The need to communicate openly and honestly, love hard, deeply, and with total abandon. Live in the moment… Tell the truth, don’t get bogged down with other people’s issues, build yourself up in the word. Thank you, Carla! Great advice. Love you! Thanks for sharing and your entrepreneurial spirit that also highlights your christian values. Basically as a wife and mother in my book on the marriage section I highlighted the point that; Practice divine love and dedicate everything you do and all your effort in the family to the Lord. Do everything for the love of God and not only man. It is God who placed you in that role and will always give you the grace and power to overcome and live with joy and happiness in that role of being a wife and mother.